Quite simply, Martin Popoff’s Sabotage! Black Sabbath in the Seventies marks the most intensive analysis of Black Sabbath’s first eight albums ever attempted. This is a big book—129,000 words long, every song analyzed in detail, loads of first-hand interview footage from close to 50 interrogations. 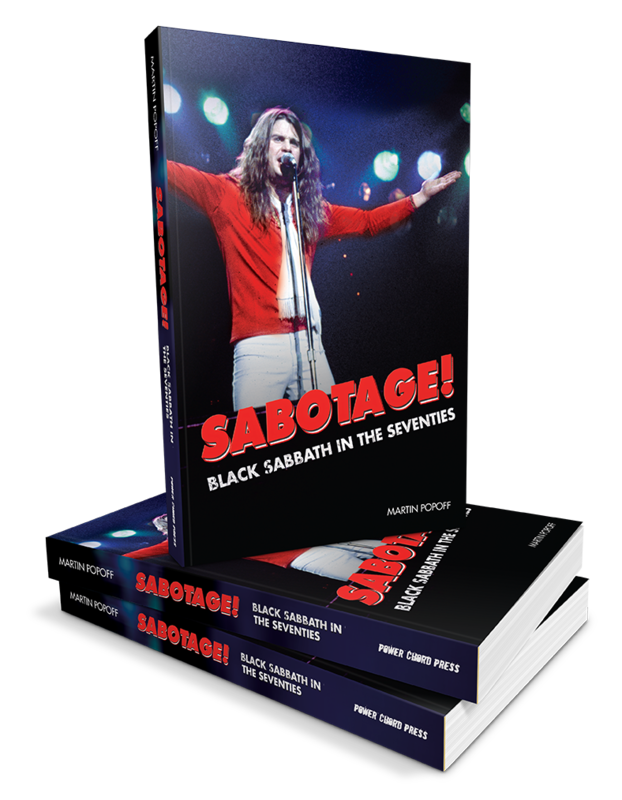 In the baking, Popoff interviewed all of the principles—Ozzy Osbourne, Tony Iommi, Geezer Butler and Bill Ward—repeatedly, along with myriad other folks who are part of this remarkable tale. Black Sabbath, Paranoid, Master of Reality, Vol 4, Sabbath Bloody Sabbath, Sabotage, Never Say Die and Technical Ecstasy… these are the building blocks of heavy metal, and within these awesome audio chapters, Popoff breaks down each and every song on each of these reverberating and cannonating records, while Geezer offers explanation of the lyrics, Bill poetically explains why these songs resonate and Tony and Oz look on with their characteristic sense of bemusement. Also touched upon are the band’s torrid troubles with money and management and drugs and booze, as well as tour tales, album cover stories and production tips ‘n’ tricks. Also included are two four-page sections of colour plates. All told, it’s everything needed to send the reader back to the catalogue, headphones on, for a second listen of this landmark run of records spanning 1970’s self-titled debut to 1978\s Never Say Die, the shambling, controversial last gasp before Ozzy’s shocking ouster from the ranks. Book will be signed to you from me, so let me know if it is a present for someone else, or you don’t want it signed. Ask me if you’d prefer a PayPal invoice (please indicate what country you are in), or just do yer usual and direct funds to martinp@inforamp.net. Or mail payment (personal check in US funds, cash, or INTERNATIONAL money order), to: Martin Popoff, P.O. Box 65208, 358 Danforth Ave., Toronto, Ontario, Canada M4K 2Z2. Sweet postage savings to be had for multiple orders (or two of pretty much anything—long story, ask me! ), for US and Canadian orders. Email me at martinp@inforamp.net with any further questions. Email me at martinp@inforamp.net with any further questions, and see www.martinpopoff.com for descriptions, cover art and ordering info for my other available 30 or so books.